Now, that has been a long time since we have been praising Xiaomi. The Chinese company is doing wander in the market with its low priced yet good quality smartphones with hardware as good as that of any brands. Xiaomi Mi 5X aka M1 A1 is the latest addition of the company in this wonderful journey. The overall specifications of the product are detailed by our experts and will allow you to understand its key specs and figures easily. 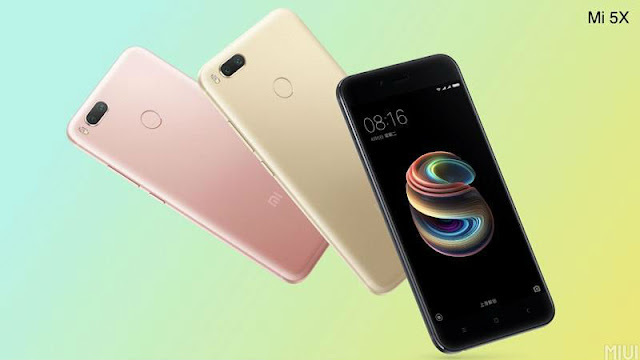 Xiaomi Mi 5X was launched in July 2017 in the European market first. It comes with a 5.5 inches LTPS IPS LCD capacitive touchscreen display with a resolution of 1080X1920 pixels. It has a 16:9 body ratio aspect. The Xiaomi Mi 5X runs on Android 7.1.2 (Nougat) which is upgradable to Android 8.0 (Oreo); It supports Android One is powered by MIUI 8. It is also powered by an Octa-core processor and comes with a Qualcomm MSM8953 Snapdragon 625 chipset making it a beast. It comes only in one variance with 4GB Ram and 64 GB internal memory. It can be upgraded up to 128 GB using a microSD card which uses the Sim 2 slot. The phone has two sim card slots with Hybrid Dual Sim option. The Xiaomi Mi 5X comes with a powerful Non-removable Li-Po 3080 mAh battery with charging 5V/2A 10W. Its’ body Dimensions are 155.4 x 75.8 x 7.3 mm (6.12 x 2.98 x 0.29 in) with an approximately 70.1% screen to body ratio. It weights around 165 g (5.82 oz). It is build using Front Glass and an aluminum frame has been used as the back. Xiaomi has provided with a Corning Gorilla Glass 3 to its display to ensure its customer's user-friendly display. Moreover, it has a satisfactory 403 PPI density. Tips to Know How To Secure Android Phone Device? Xiaomi offered every connectivity options with Mi 5X including Wi-Fi, GPS, Bluetooth, Infrared, 3G, and 4G. It also comes with sensors that include Compass/ Magnetometer, Proximity sensor, Gyroscope, Accelerometer, and Ambient light sensor. What makes Xiaomi Mi 5X so special is its excellent camera taking mobile photography to a whole new level. It provides two main cameras at the back each having 12 megapixels. The first camera provides 12 MP, f/2.2, 26mm (wide), 1.25µm, PDAF option while the second camera provides with 12 MP, f/2.6, 50mm (telephoto), 1.0µm, AF, 2x optical zoom options. The back camera has Dual Led dual-tone flash and HDR, and Panorama availability. You can shoot at 2160p@30fps,1080p@30fps, 720p@120fps with the main camera. The front camera comes with 5 megapixels option for selfies. You can shoot selfie video at 1080p@30fps using Mi 5X. Coming in the sound option Mi5X supports Vibration; MP3, WAV ringtones and loudspeaker. The most amazing part is that Xiaomi hasn’t compromised with 3.5mm jack like other companies. It makes Xiaomi Mi 5X aka M1 A1 all the more loveable. Moreover, it supports USB 2.0, Type-C 1.0 reversible connector. It was released in September 2017 with four different color variances. These are Black, Gold, Rose Gold and Red. It has a price range of approximately around 170 EUR. These are some of the key specifications of Xiaomi Mi 5X. This beast is running greatly with such great features with a comparatively mid-range price tag.